When we perform Fang Song放鬆, we stimulate the front channel, the Ren Mai任脉 and the back channel the Du Mai 督脉. “Ren任” means “duty” and” Du督” means “direct or governor”. These channels need to be smooth and also connected together. Once we close our mouths and let the weight go onto our legs, these two channels will form a circle. 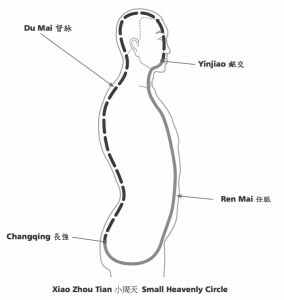 This circle we call Xiao Zho Tian小周天, which means Small Heavenly Circle. A Heavenly Circle must be very important. We have many channels all over the body. In particular, the 12 main channels relate to our major organs, such as the lungs, heart etc. however these are not as important as the Ren Mai and Du Mai. Once Ren Mai and Du Mai has been formed a circle then it is much easier for the other 12 main channels to flow smoothly and have more Qi, then we will be healthier and our condition will be better. So when we practise Qigong, we must do Fang Song and Shou Gong, keeping our mouths closed and our weight on our legs.